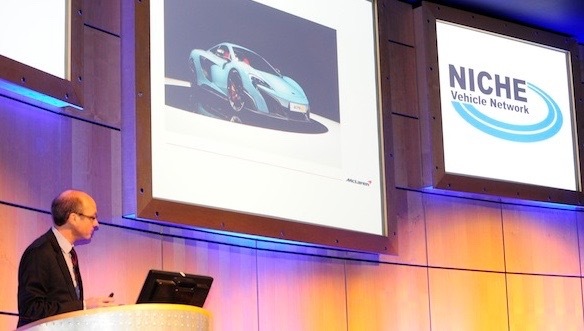 The keynote speaker at this year’s Niche Vehicle Symposium was Mark Gayton, Project Manager for the new McLaren 675LT, and his message was that McLaren wants to source more components from UK suppliers. 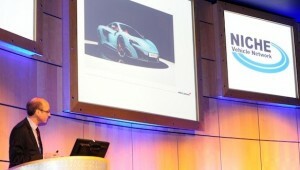 Mark Gayton, Project Manager at McLaren Automotive, gave the opening keynote address at this year’s Niche Vehicle Symposium held on 16 March 2015 at Williams F1 Conference Centre in Oxfordshire. Mark was the Project Manager for the recently announced McLaren 675LT – an even more driver-focused version of the 650S. A significant number of improvements have been made to result in the track-focused 675LT having more emotional driver appeal. Mark’s main message was that he would like to work with more UK suppliers. Mark also said that meeting potential suppliers was a big challenge – and that events such as the Niche Vehicle Symposium helped with this. The event featured a number of other speakers, the majority of which gave presentations around the theme of small companies developing new technologies – mostly advanced propulsion technologies, and material and structures innovations – for low volume vehicles produced in the UK. Organisations presenting included Innovate UK, Westfield Sports Cars, Williams Advanced Engineering, RDM Group, the Advanced Propulsion Centre and Far-UK. At the end of the day came a very interesting presentation from Aero Research Partners about the Catesby Wind Tunnel. This is a Victorian railway tunnel on a long disused section of the Great Central Railway in Northamptonshire, and there are plans afoot to convert it into wind tunnel for testing vehicles. In 1897 the Catesby Tunnel was opened and it operated until 1966 when the Great Central, like many British rail lines in the same period, was closed and abandoned. Since then the tunnel, which is straight and measures 1.7 miles, has been left vacant. The plan is to use the facility as a wind tunnel, with vehicles being driven through it. The Catesby Aerodynamic Facility will be commercially available when it opens. It could feasibly be used as a repeatable testing facility for road cars, race cars, CO2 emissions testing, etc. It has the benefit of being in a controlled environment, with no variations in weather, the noise of racing cars will be contained within the tunnel, and secret new vehicles can be tested out of sight. With the potential for conducting testing in the areas of emissions, economy and drag, the Catesby Wind Tunnel has an excellent fit with the low carbon agenda.